Whether you’re moving to the Denver area for a few months or hoping to plant roots here for a lifetime, Dolores Mozer is one person you want to know. Why? Because she brings more than three decades of relocation know-how to her position—and she’s also really easy to talk to. As the first point of contact for most of Destination Denver Realty’s relocation clients, Dolores says the best part of her job is getting to know each client’s situation and making them feel at ease about their upcoming move. Whether they’re being transferred out of the area and need advice about selling their home or are transferring into the area and have countless questions about neighborhoods, school districts, art venues, etc., Dolores strives to pair them with the broker who can best meet their needs. Throughout her own life, she’s experienced firsthand the adventure of six corporate relocations, and has lived in St. Louis, Missouri (where she grew up), as well as Mississippi, Arkansas, Texas and—for the last 30+ years—Colorado. 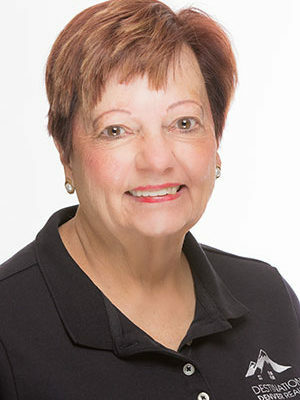 Professionally, Dolores has worked for real estate brokerages as well as moving companies, and has found her current position to be the perfect fit! She is a Certified Relocation Professional (CRP) and belongs to the Relocation Directors Council (RDC) as well as the Worldwide Employee Relocation Council (ERC). When she’s not sharing the ins and outs of relocation with others, you’re likely to find Dolores spending time with her family or sampling delicious fare from new restaurants—and sometimes she even dares to do both at the same time! Dolores can be reached at dolores@destinationdenverrealty.com or 303-475-5045. Once (accidentally) hit her Algebra teacher—a nun—with an eraser during class. Has 14 grandchildren and swears she loves them all equally. Loves to travel almost as much as she loves her family. Is afraid of heights (but didn’t let that stop her from literally crawling onto a bridge above a waterfall in Yellowstone National Park to check out the view). Co-workers call her The Company Mom—kind, caring, determined, down-to-earth, perpetually optimistic, and seems to know everyone in town! This year, Dolores is raising funds for the Tennyson Center for Children, a local charity dedicated to empowering children who have experienced abuse, neglect, and trauma to bravely and safely change their life stories. You can support her fundraising efforts by learning more or donating online at tennysoncenter.org.